We supply a selection of designer paints for your home. All are made in the UK and boast high quality and intense pigmentation, which will out-class paints typically found in DIY stores. If you are looking for the best paint to coordinate with your home décor then we have four top brands available. Each brand has a unique palette giving you a choice of 100s of shades in numerous finishes. The Designers Guild paint collection consists of 156 beautiful contemporary colours, from chalky neutrals through to vibrant hues for which they are famous. All colours are available in 4 finishes: perfect matt emulsion; perfect water based eggshell; perfect floor paint and perfect masonry paint. Wood primer & undercoat is available in 3 shades of white or grey. It all started in 1900 with a small collection of paints designed to complement the Arthur Sanderson & Sons wallpaper collections. Today, you will find yourself spoilt for choice with Shades of Sanderson – a comprehensive range of paints featuring 140 shades. The timelessly elegant palette has been designed with both traditional and contemporary homes in mind and specifically curated to complement our fabric and wallpaper collections. Sanderson paints are bursting with the best grade pigments to ensure quality of colour, excellent coverage and a smooth application that professionals love. Every shade is available in three finishes, giving you the opportunity to work across your entire home. You will find the perfect finish for walls, woodwork and metalwork. Even the most lively of family homes can enjoy the Sanderson touch with our Active Emulsion – specifically designed for hard-working spaces such as hallways, family rooms and kitchens. Exceptional coverage, outstanding depth of colour and an effortlessly sophisticated palette is the hallmark of the Zoffany paint collection. Immerse yourself in the alchemy of colour with 156 exquisite shades, fine-tuned to perfection and beautifully curated to complement and enhance our fabric and wallpaper collections. The Zoffany colours have evolved through experimental work with natural plant dyes, organic stones, minerals and jewel tones from the Zoffany archive. Featuring bold highlight colours including Tiger’s Eye, Koi and Malachite as well as versatile neutral shades, this unique palette evokes artistry and sophistication. Each shade is available in three finishes; elite emulsion, acrylic eggshell and eggshell. Each finish is crafted to the highest specification and infused with superior grade pigments. For you, this means flexibility to create décor schemes across your entire home, including walls, woodwork, metalwork and some exterior surfaces. The collection also includes tints of Zoffany’s most versatile neutrals, enabling you to create dynamic schemes within one colour group. For example, using quarter, half and double tints on walls and woodwork. The end result imbues a subtlety and finesse that commands the gaze of the most discerning eye to add depth and dimension. 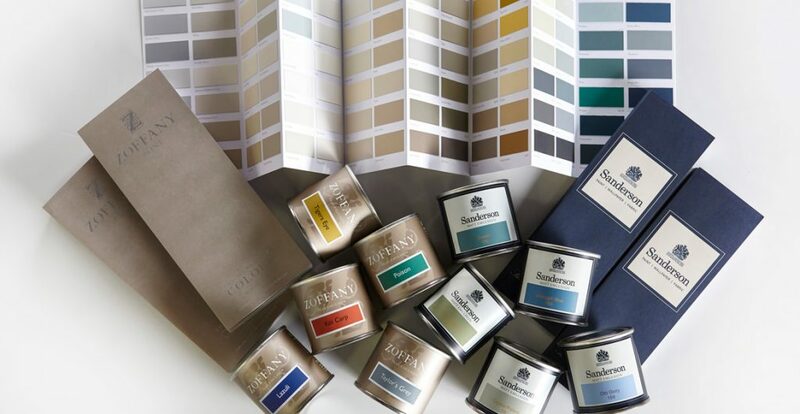 We are an approved “professional supplier” of Little Greene Paints. Little Greene have a comprehensive palette range and various distinct collections that should suit any style in your home. For full details see Little Greene. All our paints are made in the UK and you’ll be pleased to know that they are formulated to minimise volatile organic compounds to reduce atmospheric pollution. Paints are all mixed to order but are delivered quickly to us or directly to you. Please note that paint colours do not reproduce well on computer monitors or in print. You are always wisest using professional paint charts and chips and testing colours with tester paint pots. We can help you choose your ideal colours and help you coordinate them with fabrics and wallpaper. Come and visit our shop in Dunnington. We look forward to helping you find the right colour.